LIVE STREAM: MS6 students who would like for a family member or friend to watch the MATCH Day Ceremony may email them the link below. Live feed will be available in real time only. Staff and faculty who cannot attend the event should also feel free to utilize the link. The stream will be available starting at 10:45AM. GUEST PARKING: Free parking will be available 10:30am to 1:00pm the day of the event. Guests must park in levels 4-7 of the UMKC parking garage. 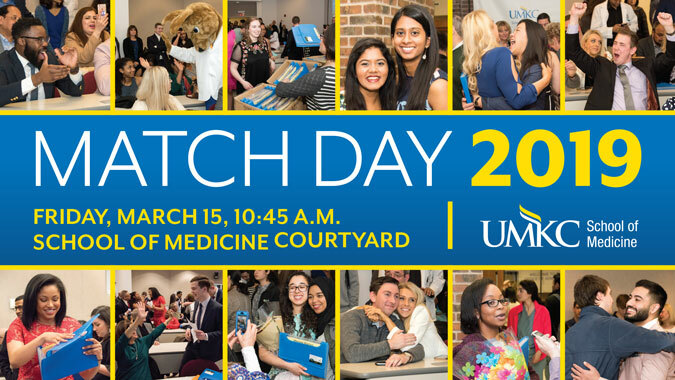 Family and friends can also follow the excitement by using the #UMKCMatch2019 hashtag and the Association of American Medical Colleges (AAMC) hashtag #Match2019 on social media.